Though I have yet to meet a lasagne I do not like, when I’m hungry for lasagne it is most often Mom’s simple recipe that I crave. Feel free to substitute fresh pasta sheets or no-boil lasagne noodles if you like. Make the sauce: In a large sauté pan, cook the beef, sausage, and onion until the meat is no longer pink and the onion softens. Drain fat from the pan, if any has accumulated. Add tomato paste and sauce, chopped tomatoes, and herbs. Simmer 30 to 60 minutes, until the sauce is thickened and the flavors have melded. Add salt and pepper to taste. Assemble the dish: Cover the bottom of a large, shallow rectangular pan with some of the tomato sauce. Over the sauce, distribute a layer of the cooked noodles, then top with ⅓ of the mozzarella cheese and half of the ricotta or cottage cheese. Make another layer, beginning with sauce, topping with noodles, and ending with ⅓ of the mozzarella and the remaining ricotta/cottage cheese. For the final layer, place the rest of the noodles, top with the remaining sauce, and sprinkle with the rest of the mozzarella cheese and all of the grated Parmesan. 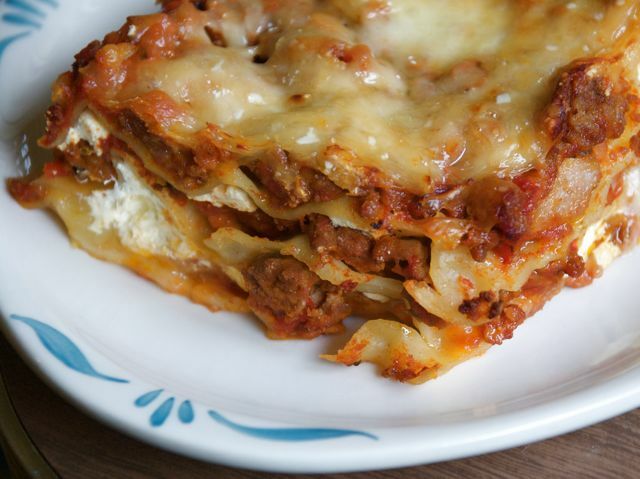 Cook the lasagne: Bake lasagne for 30 to 40 minutes, until bubbly and hot. Let cool slightly before slicing into squares to serve.